Here you will find information about events organised by Pathfinder. Events will be added to this as they are confirmed. People who have already completed a round canopy parachute course are required to complete a refresher course under Pathfinder before jumping at Pathfinder events. To jump with Pathfinder on round canopy parachute events it is necessary to complete our course to ensure standards. The main purpose of the basic course is to get people trained so they can do other jumps with Pathfinder and at other events. 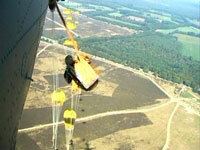 Two basic round parachute courses are run every year in Teuge, Holland. These are taught / conducted by instructors from Pathfinder and consist of ground training, 5 jumps, and learning to pack parachutes. This course is run twice yearly. Once you have completed this couse you will be awarded the Dutch Military Parachute Wings. Below are details of the basic parachute course. The aircraft normally used for these courses is the Antonov An-2. A standard military (stand up) exit is done from this. The Cessna C-208 "Caravan" is also used sometimes, where a helicopter style exit is done. Both aircraft used are enjoyable to fly in and jump from. It is planned that in future it may also be possible to use a C-47 Dakota for some of these courses. One of the main activities of Pathfinder is the commemorative jumps. Each year the group jumps to remember the Battle of Arnhem in Holland. Here, members are given a unique opportunity to jump from a vintage Dakota DC-3 (C47) aircraft. Jumpers are encouraged to wear 1944 style uniforms at this event.Other commemorative jumps include drops at Normandy in 2004, Semnoz and Vercours in the French Alps in 2005 and onto the Appelse Heath in eastern Holland in May 2007. The group also does demo jumps with Square / freefall rigs from time to time. Being a member of Pathfinder also means that you may jump with other friendly groups at their events. For example this year a group from Pathfinder will be making commemorative jumps in Normandy with the American group, the Liberty Jump Team. Members of Pathfinder regularly attend jump courses in countries such as Estonia, the Czech Republic, Italy, Poland, the UK, Israel, Russia, and even as far afield as Thailand and Cambodia. From time to time other special jumps are organised. These include night jumps, water jumps , equipment jumps, HAHO (High Altitude High Opening) courses and square courses. In addition to parachuting the are from time to time historical tours and adventure trips organised. For example in spring 2006 Pathfinder Holland conducted a tour of the Eben Emael Fortress in Belgium, the site of the famous German airborne assault in 1940. A series of jumps are been organised in China and is a unique opportunity to jump with the Chinese PLA. This trip is for qualified jumpers only. Details to be announced.